This is another one of those wedge shaped cars that I like so much. Introduced in 1981 the 280i came with the Ford 2.8 liter V6 Cologne engine. The transmission, brakes and much of the suspension was also from the Ford parts bin. Its 0-60 time was in the 8 second range and it had a top speed of 130 MPH. The bodies were made of fiberglass and sat on a tubular steel chassis. The 280i was available in coupe and convertible form. TVR stopped selling cars in the US in 1987, although they remained in business and produced some very impressive cars including the Chimaera, Cerbera and Tuscan. According to the seller, the car being offered on eBay was one of only 7 convertibles sold in the US in 1987. The car, while not restored (it didn't need to be), has had work done to it (including a custom built A/C system) and has been well maintained. The price is on the high side, but this appears to be a car you could confidently drive the day you buy it. Click here to see the eBay listing for this 1987 TVR 280i convertible. In July of 2004 TVR was sold to 24 year old Russian businessman, Nikolay Smolensky. (Nope, that not a typo... the new owner of TVR was 24 years old. When I was 24 I would have been very happy just owning a TVR car. This guy bought the whole company!) Things didn't go quite as planned and TVR has been in and out of business throughout most of this decade. The last I heard (sometime last summer) was that it's back in business (again owned by Smolensky) with plans to sell the Sagaris worldwide. BUT, a quick search of the internet turned up nothing but 2008 press releases. If anyone knows anything else, please let me know. The TVR corporate website is still up. Click here to see it. 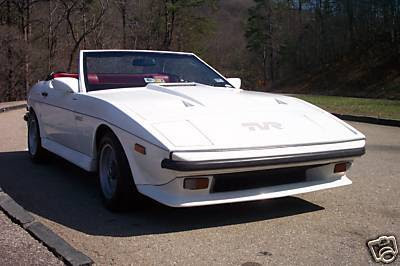 Click here to find the TVR Car Club of North America site. You need to scroll down to the bottom of the homepage to find the sites links.